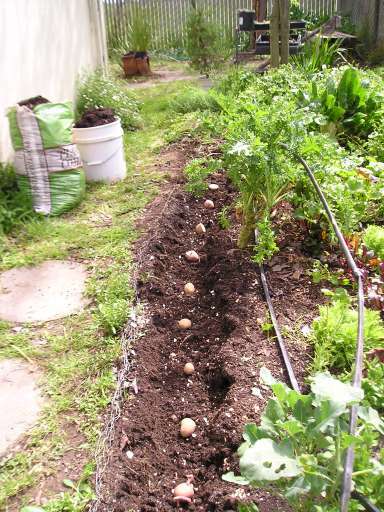 Bursting spring; planting potatoes in limited space; spring pests. Wow, what a powerfully beautiful spring we are having! With the blessing of water in the ground and adequate winter chill, fruit trees, roses and other plants that go winter dormant are bursting into bloom and new growth. Although there are still puddles and very wet soil in some places, the soil in my garden is perfect for working and raised beds may even be getting dry. I’m finding big variations in soil moisture. Remember that you cannot tell how moist soil is a few inches down by looking at the surface, so keep a small shovel or hand trowel handy to dig down and check. Sometimes we get what we ask for. We are lucky to have gotten the rain we’ve been praying for, and some plants that I’ve been encouraging have now “naturalized” in my garden. The “cover crop” in much of my garden this winter was mache (aka.“corn salad”), Miners lettuce and parsley. I’ve been enjoying, (and sharing), these along with my over-wintered lettuce, escarole and endives. Since these are all starting to bolt, (go to seed), now, I have been clearing out areas by cutting roots off just below soil surface. Those beautiful greens are too good to waste, so I’m laying them down in thick layers around paths and perennials to act as a mulch. Many weeds that have not gone to seed can be used as mulch too. Alternately, they would be great to use in compost. Seed potatoes in a trench. to not grow potatoes in the same spot 2 years in a row, I was trying to figure out how to squeeze in a row of them in the last couple of weeks without taking out plants I’m still harvesting from. Potatoes are tubers – modified stems – that grow above the “seed” potato. Any part of the stem that is buried will make potatoes, and the parts above soil level make green leaves. I like to plant potatoes in a trench that is 4-8” deep, then as the stems grow, I gradually cover with soil, always leaving a couple inches of leaves exposed to keep growing. Since I did have space on the edge of a bed, I realized that I could put the soil from the trench in buckets or old potting soil bags instead of piling it on the edge of the trench. After taking the photo to the right, I planted each seed potato in place covered by about an inch of soil. No need to water the seed potatoes at this point; I check expectantly for new shoots to emerge and when they are clearly growing, I will start watering my potatoes. Unfortunately, spring pests burst forth with the warm weather we had some days in March too. We have not seen many slugs or snails the last couple of years due to the drought, but they are around and breeding now. Cleaning out those over-wintered plants and weeds exposes the slugs, and I check carefully in established plants for snails. Leaf miners exploded in the leaves of my chard and beets, so I check those carefully too and destroy the leaves or parts of leaves with leaf miners in them. And I saw one harlequin beetle in a tree collard, so am keeping a close eye on them too. Rodents have gotten active as well; moles, voles and gophers are tunneling and breeding, so trap them if you can. Mowing the grass and weeds reduces hiding places for these rodents and makes it easier for predators, (eg. hawks, owls, coyotes, and hunting cats), to catch them. I just read an article about the importance of systematic “monitoring” for pests on farms. The author recommended walking the farm on the same day each week with a clipboard and chart to record numbers of certain pests or disease symptoms on certain crops to help determine patterns and when it could be necessary to implement controls. A key point was to be aware of a potential problem and take action before a full “infestation” occurs. When doing this on a garden scale, it can just be about slowing down and paying attention in the garden. Look to really see what is going on, and be patient. This is also how one develops a deeper relationship with your garden and the process becomes more satisfying over time. Wildflowers are popping too, so since it’s still too early for the main summer plantings, take a break from your garden and get out for a hike where you can enjoy nature’s glory. Take time to smell the roses- there is still lots of time to plant. 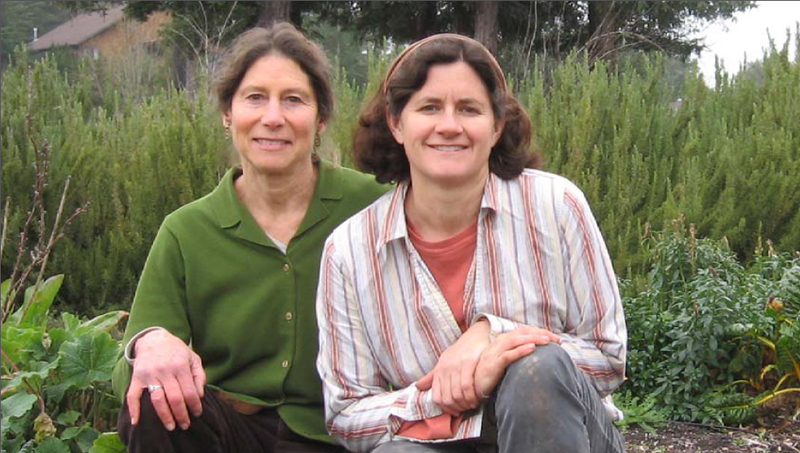 iGrow blog authors Wendy Krupnick (left) and Sara McCamant (right). Copyright ©2015-2019 iGrow Sonoma. All rights reserved.